The guys got to Detroit and were now heading back to the hotel after practice for a lunch time meeting and then everyone was going to rest until the game. The meeting luckily for the guys was short and so everyone was ready to nap. Sidney went to his room that he shared with Marc Andre Fleury. Marc was still talking with the goalie coach and told Sid he would see him in the room shortly. Sidney got in the room and went and sat on his bed. He decided to call Carrie just because he could. "Hey hot shot what's going on with you?" asked Carrie. "I am good. We had a good practice and a team lunch meeting and now I am getting ready for my nap before the game" Sidney said as he laid back on several pillows on his bed. "Sounds like you have had a very busy morning so far." "Yes it has and I am exhausted. Plus I miss you doll face and wish you were here because I always sleep better holding you." "Oh good lord, Sid can you be any more corny with that line but I love you anyway" Carrie said as she rolled her eyes. Just then Marc Andre walked into the room and heard Sidney talking to Carrie. Sidney nodded at his friend. Marc nodded back and went over to his bed and sat down to take off his shoes and get ready for his own nap. "I know that you love me even if I am so corny its ridiculous" joked Sidney. "OK well listen I need to go and eat some lunch myself so I am going to have to go. I will talks to you later, Sid. I love you." "I love you too doll face. Later." "Hey Sid, how's Carrie doing?" asked Marc as he laid down and got comfortable on his bed. "She's good" Sidney said as he laid down and got ready to go to sleep. "Cool man" Marc said as he drifted off to sleep himself. A couple of hours later, Sidney and Marc got up from their naps and then got ready to head over to the arena for the game. The game did not go the Penguins way at all. They lost badly and Coach Bylsma talked with everyone before they showered and got ready to head back to the hotel. On the bus ride back to the hotel some of the guys decided to go out to a bar and try to have some fun. Sidney agreed to go with the guys because he figured it would be better than sulking in his room and mulling over what he could have done better. So Sidney, Marc Andre, Jordan, Max, Tyler, Evgeni, Craig, and a few others planned on meeting in the lobby in a half an hour to head out for some guy fun at the bar. The crew found a cool bar and found a table and ordered some drinks and just started talking and checking out the scene. They were all having a great time and the drinks were flowing. Some girls were staring their way and the guys were joking that they were after Sidney. Then one of the girls came over and went straight for Sidney. Craig noticed this and watched because Sidney was not completely wasted but he had knocked back a couple and was kinda buzzing. Sidney smiled at the girl as she sat down next to him and was talking to him but he kept his hands to himself. Her friends came over and sat down too and started talking with the other guys and everyone was having a good time. 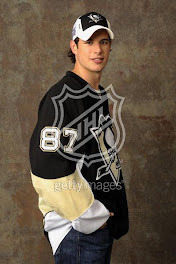 At one point the girl talking with Sid put her hand on his leg and was doing some serious flirting. Sid flirt a little but when the girl kissed him, he pulled back and told her that he was in a very serious relationship but the girl told him 'who cares and your girlfriend will never know'. Craig saw this and looked at Sid and Sid looked at Craig and knew that Craig was going to tell Carrie what had happened and Sid did not like that idea at all. Sidney finally got up and said that he was heading back to the hotel. Marc got up too and said that he was joining Sidney. They left the others behind. "Oh god Marc, what I am going to do. Craig is seriously going to kill me. I have to talk to Carrie first" Sidney said as he pulled out his cell phone and called Carrie even though it was late. He needed to make sure she knew what had happened. Sidney waited for Carrie to pick up her phone. Finally after three rings a very sleepy Carrie answered her phone. "Hello" Carrie said half awake. "Hey doll face. Sorry to wake you up but I have to talk to you." "You know we lost the game and so the guys decided to go to a bar this evening and I went with them and we were drinking and some girl came over to me and kissed me. I told her I was in a serious relationship and so I am now leaving with Marc and heading back to the hotel. I just wanted you to hear it from me because Craig saw it too and I just don't want you to think I would ever hurt you. I love you, Carrie and as I have said all along, you are the one I want to be with" explained Sidney. "Wow you kissed another girl, huh?" Carrie was now awake and upset. Sidney could tell she was upset and wished he was there to hold her. "Doll face you know I would never want to mess up our relationship. I swear to God." "I...uh...I don't know what to say" sniffled Carrie. "Baby please don't cry I am so sorry and it will never happen again" promised Sidney. Carrie started crying harder and luckily Sidney and Marc had made it to the room and Sidney went into the bathroom and closed the door. Marc knew to give Sidney his space so he turned on the television. "Carrie please man. I wish I was there so I could hold you. You gotta know that it meant nothing and I love you" Sidney continued to plead into the phone. "I...I...wow I really don't know what to say" sniffled Carrie as she was sitting on their bed. "I love you and I know I have said that a bunch in a short period of time but I really mean it totally, Carrie" Sidney said as he started to get upset too. "I am surprised and confused at all of this" Carrie said. "I know you are and all I wish I could do right now is be there with you. I will be home tomorrow night and we can talk, ok" Sidney said because he knew it was late. And he could tell by Carrie's voice that she was exhausted and this is probably not good for them to be arguing because the stress might be bad for the baby. "Yeah I will see you tomorrow night and we can talk more. Good night Sidney" Carrie said before she hung up. Sidney looked at his phone and then put his face in his hands as he sat on the floor of the hotel bathroom. God he thought I so screwed up yet I love her so much that I won't lose her. Carrie laid in the bed for a few minutes and thought that Sidney really felt bad about what had happened. She knew deep down in her heart that he did love her more than anything and she realized that. She loved Sidney so much that she decided to call him back. Sidney was still sitting on the floor when his cell phone rang and he looked down and smiled. "I just realized that I forgot to tell you two important things. First, that I forgive you and know you did not mean to do what you did. And second, I love you more than anything" Carrie declared with all of her heart. "Oh doll face, I am so lucky to be with you and love you. I swear when I get home I am going to make it up to you by showing you how much you mean to me." "OK I can't wait to see what you are going to do meanwhile I am tired so good night and I love you, Sidney." "I love you too, Carrie. Good night." They both slept very well that night knowing that they loved each other not matter what they went through as a couple.